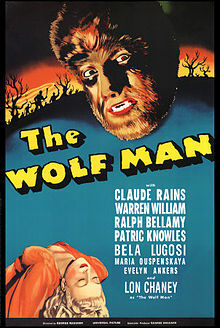 For all the werewolf movies we’ve had over the years, the defining wolf-man comes from Universal’s 1941, The Wolf Man. Each and every werewolf movie since have owed less to the European folklore than the script written by Curt Siodmark. For the writer invented many of the conventions of the genre in Universal’s classic – even the rhyme that starts this article was written by Siodmark and not, as many people assume, from actual folklore. The movie takes place in the fictional Welsh village of LlanWelly into which Larry Talbot (Lon Chaney Jnr) returns after being educated in the USA. He visits a gypsy camp with village girl Jenny Williams, who is attacked by Bela Lugosi, a gypsy who has turned into a werewolf. Larry kills the werewolf but is bitten during the fight. Bela’s mother tells him that this will cause him to become a werewolf at each full moon. Larry confesses his plight to his unbelieving father, Sir John, who then joins the villagers in a hunt for the wolf. Larry, transformed by the full moon, heads for the forest and a fateful meeting with both Sir John and Gwen. The reason this movie still works so well is totally down to Lon Chaney Jnr’s performance – the actor effectively portrays guilt, torment and sentiment and his wolf man, like Karloff’s Frankenstein, is a pitiful character. 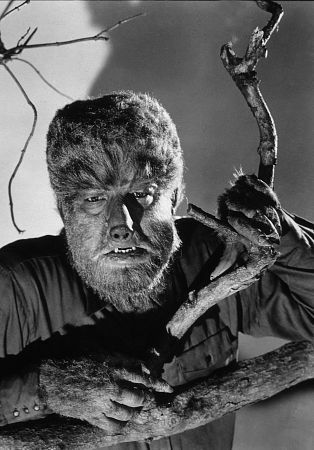 The movie had originally been intended for Karloff but Chaney was cast at the last moment, and so good was he that it is difficult to imagine another actor as the Wolf Man. There are several well known goofs in the movie – Talbot refers to Captain Montford, when the credits show him as Colonel Montford – When the wolf man is caught in a trap and falls over a log, the arm of his shirt raises, revealing a gloved hand – When Larry Talbot sits on the chair of his room and first changes into the Wolf Man, you see only his feet change. However, when the Wolf Man stands up, the pant legs ride up from his furry Wolf Man feet and you can see bare skin on his legs above the top of the “Wolf Man feet” boots he is wearing – When Maleva, the Gypsy woman, asks to see Larry Talbot’s wound from the wolf bite, he unbuttons and spreads his shirt front (with his bared chest outside the camera’s view). Talbot then proceeds directly home where he begins to change clothes. He removes his shirt to reveal that he is wearing a T-shirt underneath. The film is available both as a standalone DVD and as part of the Universal’s Monsters set. The special features are the same on both versions with a documentary, trailer, commentary and a picture archive. The restoration of the transfer is up to the high standards expected from such a big name studio, and the film’s never looked or sounded better.